I just participated in the 2nd annual 48-hour Node.JS Knockout competition together with James Halliday, Joshua Holbrook, and David Wee. Almost the same team as the last year. This year we called ourselves Replicants and we created a real-time code coverage heatmapping application called Heatwave! If you like our app, please give us thumbs up, that will really help us out. You can vote for our app at Replicants team page. 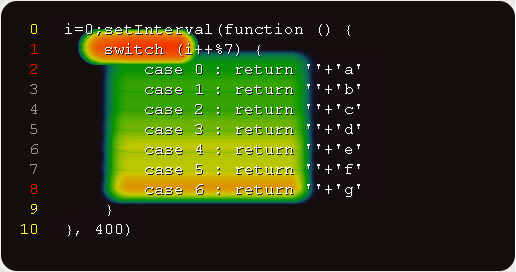 So you can either paste the code snippet right on the site and run it and it will show live code heatmap as it runs. And with curl you can even upload multiple files to the same page, which is super neat. We had really great team work. Josh, James and David hacked from Joyent and we communicated over IRC, just like the last year. Each of us had a separate github repo and we'd just pull from each other every now and then. That's about it. The source code of heatwave is on github: heatwave source. I'm looking forward to next year's node.js knockout.